Strawberry season is upon us. So if you should find yourself in the fortunate situation of having too many tasty berries sitting around the house, don’t bother freezing them. I have a much better idea. Put them in some booze. Kind of the best idea ever, huh? Throw a few cups of ripe strawberries in a bottle of good silver tequila, and in just a couple of weeks you’ll have an amazing summer infusion. It’s great on its own for sipping, but it also makes a pretty mean margarita. 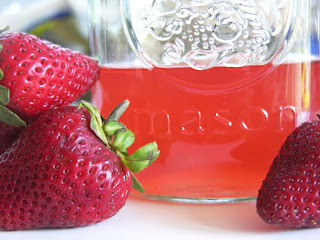 Divide strawberries into the two jars, then cover evenly with tequila. Let sit in a cool, dark location for about 2 weeks, shaking the jar every other day. Add fruit to the jar, and top off with as much tequila as you can add. Let sit in a cool, dark location for about 2 weeks, shaking the jar every other day. Put all ingredients in a shaker, shake like hell, and strain into a double rocks glass with fresh ice.